Gov. 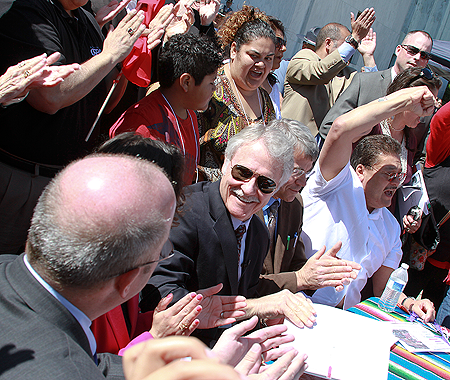 John Kitzhaber, with supporters including Jeff Stone of OAN (left) looking on, celebrates after signing SB 833B. With more than 2,000 people looking on in celebration, Oregon Gov. John Kitzhaber signed SB 833B today at a midday rally on the front steps of the Oregon Capitol. The bill directs the Oregon Department of Motor Vehicles to create a new driver’s card that is good for four years. As with a regular, eight-year driver’s license, the applicants will have to pass all required tests, prove their identity, and demonstrate that they live in Oregon. However, they will not be required to prove legal residency in the United States. The new card will be available by Jan. 1, 2014. “So many people helped make this bill possible, with Legislative leaders from both parties working with the Oregon Department of Motor Vehicles, representatives of law enforcement agencies, business, the insurance industry, faith communities, and farm labor and community advocates,” the governor said before signing the bill. “Their collaboration resulted in a bipartisan, commonsense solution — one that supports individuals, businesses, and Oregonians while improving public safety. The Statesman-Journal newspaper (Salem, Ore.) has posted a video of the governor’s remarks here. Supporters of the bill, including the Oregon Association of Nurseries, argued that granting these driver’s cards is a matter of public safety. Drivers unable to qualify for the regular license will be able to come forward to be identified, take tests, and prove that they know the rules of the road. They drew a distinction between safe roads, which are the state’s responsibility, and immigration status, which ties to national citizenship and is therefore a federal matter. Legislators from both parties largely agreed, passing the bill 20-7 in the Senate and 38-20 in the House. Stone added that Oregon’s accomplishment in passing this bill should serve as an example for the United States Congress, which is expected to consider comprehensive immigration reform soon. The term “comprehensive immigration reform” is generally defined as a balanced bill that provides added border security, allows for a sufficient workforce for industries that need it, and lays out a path to permanent status for undocumented people already in the country, up to a certain cutoff date.